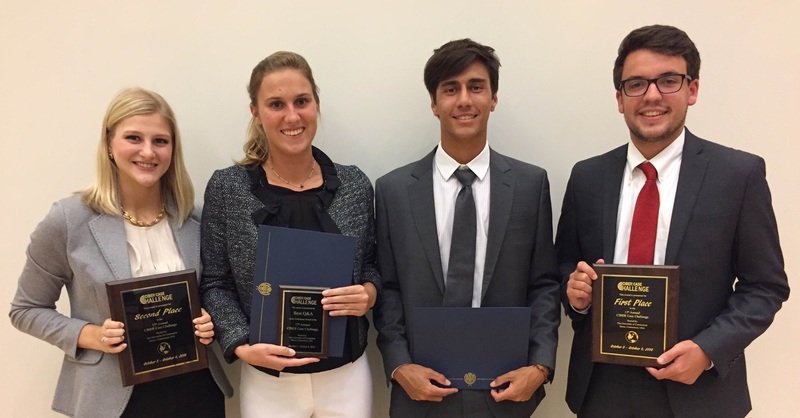 Belmont business students again represented the university in this year’s CIBER International Business Case Competition held at the University of Connecticut from October 5 to October 8. The following students participated: Laura Van Eeckhoudt, Emily Weissmann, Andrew Hughes and Caio Niel. The twelve teams in this year competition represented Belmont University, Florida State University, Purdue University, San Diego State University, Southern University of Baton Rouge, The American University in Cairo, University of Connecticut, University of Johannesburg, University of Maryland, Università di Trento (Italy) and University of Vermont. This year’s case was titled “Uber and the Sharing Economy: Global Market Expansion and Reception” and challenged the students to come up with an market expansion strategy for Uber in the Asian market. In the preliminary round, both Hughes and Weissmann’s teams won and advanced into the final round. In addition, Van Eeckhoudt won an individual award for best Q&A in the preliminary round. After the final round and judging, Hughes’s team placed first overall in this year’s competition and Weissmann’s team placed second overall.